Bairstow Eves are pleased to offer for sale this beautiful condition three bedroom detached bungalow. 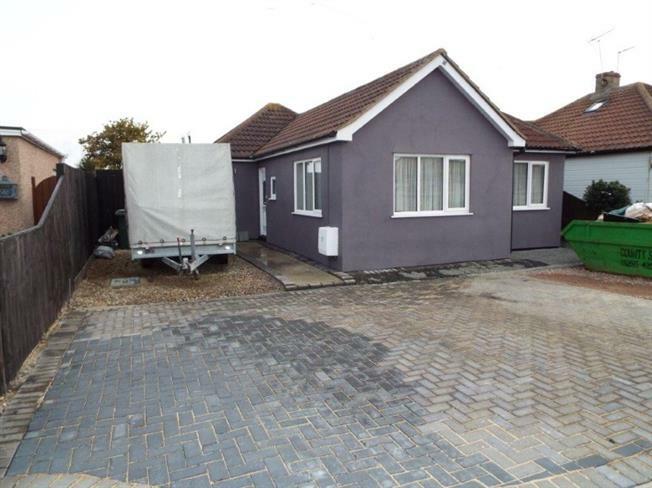 The property is open plan with bi-fold doors to the rear opening onto a landscaped garden and the property is located within the popular surroundings of Great Clacton. The bungalow has been finished to a very high standard throughout and features open plan lounge/kitchen, en-suite W/C, family bathroom, off road parking, enclosed rear garden with summer house and gym. The property really needs to be viewed to appreciate what this bungalow has to offer so please call to arrange. UPVC bi-fold double glazed door, opening onto the garden. Double aspect double glazed uPVC windows facing the rear and side overlooking the garden. Radiator, tiled flooring. Fitted units, stainless steel sink and with mixer tap with drainer, integrated oven, integrated hob. Double glazed uPVC window with obscure glass facing the side. Heated towel rail, tiled flooring, tiled splashbacks. Low level WC, top-mounted sink. Double glazed uPVC window with obscure glass facing the side. Heated towel rail, tiled flooring, part tiled walls. Low level WC, panelled bath with mixer tap, shower over bath, wall-mounted sink with mixer tap.